I haven’t been getting a ton of comments lately, so I’m kinda hoping everybody pitches in for this one, since as an atheist I’m not really qualified to comment on it. Help me out, I’m confused. There is a church near my home that I drive by every day on my way to and from work. Hell, it’s on a main thoroughfare, so I probably drive past it something like 70% of the time I leave my house. And there’s a big sign out in front of the church– wood, attached to what appear to be 12 x 12 beams, so they intend for it to be at least semi permanent– that declares the place the “church home” of the South Bend Cubs, including using their logo, which something makes me doubt they got permission for. The sign specifically names two players and their numbers; I don’t know if any more than those two attend that church and I’m not sure that two players really constitute an official team endorsement either. So here’s the question: there have to be some at least moderately religious people who read this blog. Assuming you were already Catholic, is there any universe where this sort of “rub elbows with very minor local celebrities” advertisement might entice you to check a church out? And, as a secondary question, am I right in feeling that calling these two players out and yelling HEY THIS IS WHERE YOU CAN FIND THESE GUYS ON SUNDAY MORNING to literally everyone who drives by is kind of rude? 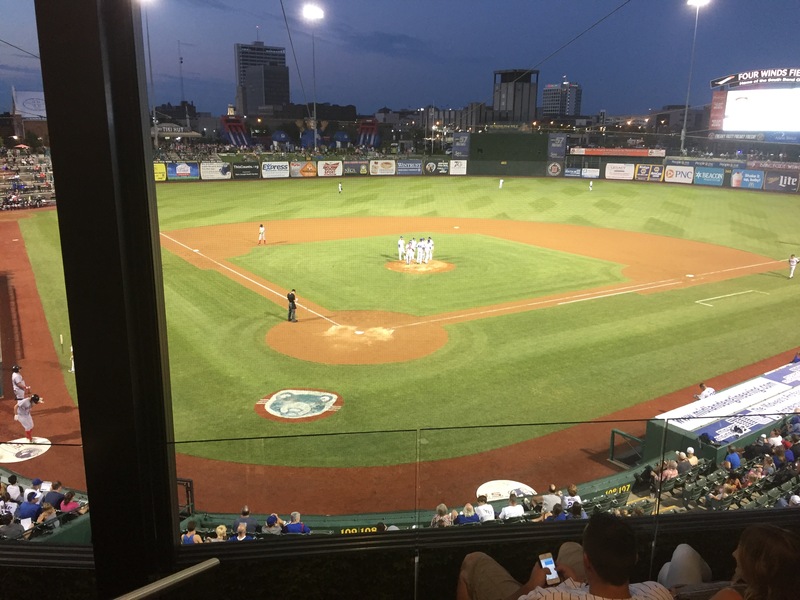 This post will be of even less interest to the majority of you than usual, mostly because the vast majority of you aren’t local, but: I attended a AAA South Bend Cubs game at our local baseball parky-thingy Saturday night. The stadium has been there a long time, but I probably haven’t been to a game since high school. I remember enjoying the several games I went to, but “several” is probably the right word. And since college I have almost completely abandoned watching sports as a means of recreation. I know more than I pretend to a lot of the time but I literally can’t name a single currently working pro NFL or MLB player, probably not more than half a dozen NBA players, and not a single college athlete in any sport. But anyway. There’s something about baseball stadiums, right? And I’ve never gotten to be in a skybox before, so being right behind home plate and in a spot where it was highly unlikely that I’d be hit by a fast-moving projectile was kinda cool. Plus, hey, cash bar that served free soft drinks and free catering. It was also a cool Dad Night, as my son knows nothing of baseball and had never been to a game, and I bought him a lightsaber to play with. He had fun too. Local folks, if you haven’t found an excuse to see a game at Four Winds Field lately, go. Tickets are cheap and the experience is generally excellent, especially if you’re able to go on a night where there are fireworks. Just sit along the third base line so you can see them better. There are grassy fields to sit on in the outfield and bouncy houses for the littler kids and the usual concessions and all that other fun stuff. If you’re around, go. Even if you’re not into baseball, it’s a great way to spend a Saturday night. Ran into a Trump supporter at work today, the first openly so individual I’ve actually encountered. I had to eventually stare him down and tell him that I didn’t discuss politics at work, and his wife clearly has grown to loathe him and his need to insert politics and crazypants into every conversation with every stranger he meets. I felt bad for her. He probably needs a therapist. In other words, pretty much exactly who I thought he’d be. …so, yeah, forgive me if there’s no blogging.